Home Blog Leasing Minecraft Education – Coming to School iPads! Minecraft Education – Coming to School iPads! Microsoft launches Minecraft Education Edition for the iPad this September. The Education Edition was previously available in schools only on Windows 10 devices as well as macOS, but this new iPad version begins rolling out to schools starting with the new term this September! If your school is licensed through Microsoft 365 for Education, you should already have access to Minecraft Education Edition and should be able to download it onto iPads. The school administrator will then need to assign the available licenses to any teachers who wish to use it in their classrooms. If your school doesn’t yet have a license, there are volume licensing agreements available through the Microsoft Store for Education and other resellers, such as HardSoft. Schools do have to pay for the software on an annual subscription basis, but you are able to try it out for free with up to 25 teacher logins, and 10 student logins. Designed specifically for use in the classroom, the Minecraft Education Edition offers teachers a number of resources that will help them to integrate the software into their lessons, including lesson plans and courses, as well as access to an online community, mentors, and technical support. The iPad version of the app includes Update Aquatic, allowing children to create stories, experiment with chemistry, and document it all via the camera and portfolio features mentioned above. These players can now use the Chemistry Resource Pack that will introduce elements and items that are craftable using chemistry features. With this installed, players create elements and combine them into compounds, build a periodic table and combine materials using chemistry to create new items like helium balloons, sparklers, latex, and underwater torches, Microsoft says. Other lessons can teach subjects like history, language, art, STEM, and much more. Following on from Update Aquatic, Microsoft has teamed up with BBC Learning to launch a collection of lesson plans, written by teachers, focused on our oceans. Students will write code, build sensors, analyse data and create in 3D and mixed reality to answer questions such as “How do sharks swim?” and “How does coral grow?” when they take on the roles of biological oceanographers and marine geologists, biologists and physicists. 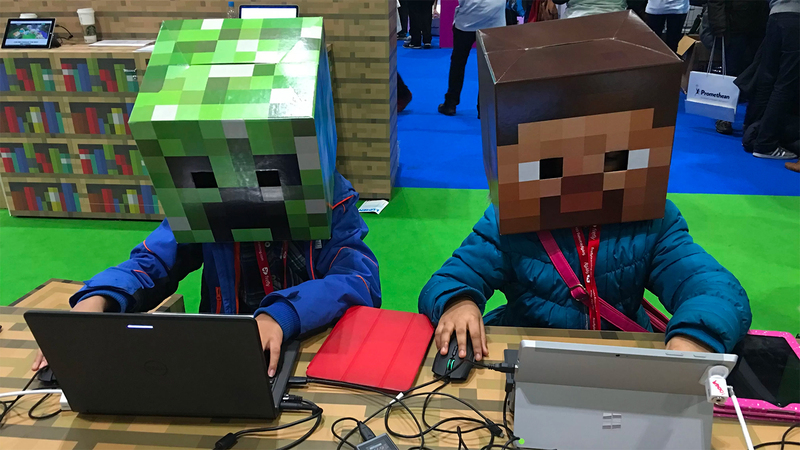 Minecraft was already being used in over 7,000 classrooms across 40 countries worldwide when Microsoft bought the game company Mojang in 2014, and that’s without Minecraft’s official involvement. Microsoft says that, as mentioned above, the software has now been licensed by 35 million teachers and students across 115 countries. We know a few children who are desparately hoping their school will join that number very soon! If you’d like to find out more about leasing iPads for your school, give our Education team a call on 020 7111 1643 and they’ll talk you through all of your options available.